In this mini-magazine, I share my tips and tricks for photographing your garden in its best light, whether you’re shooting with a DSLR, point-n-shoot, or smartphone. You’ll learn about composition, harnessing the light, photographic resources, and what’s in my bag. Photographing gardens and the natural world has been enormously rewarding for me. Below are some sample pages from the mini-magazine. Read your manual, shoot regularly, learn how to process your digital images and above all else, always stay curious! My Kenilworth Park and Aquatic Gardens stamp made the cover of the August issue of The American Philatelist and was featured inside as well. Thanks for the exposure and my copies, Jay Bigalke (editor and designer of the magazine)! Yay! Another stamp with the USPS! I’m a USPS stamp artist three years in a row with this announcement. Pretty exciting stuff! My image is one of the 16 featured in this release. They announce one release per day and this was the 11th stamp announced. The entire National Park Forever stamp series debuts June 2 and will be available in post offices nationwide. RE-POST: In spring 2012, I had my first botanical photography exhibit, “Garden Muse: A Botanical Portfolio,” at Green Spring Gardens in Alexandria, VA. Barbara Kelley of Kelley Hospitality (who is also the editor-in-chief and my partner with Celebrate Home Magazine), did a phenomenal job of catering the reception in mid-April. There wasn’t a crumb left of anything when the event was over! Barbara shares her yummy recipes and party tips in “Inspired by the Garden: Garden Muse Tea Reception,” in the summer issue of Celebrate Home Magazine. Barbara and I published four issues of Celebrate Home Magazine as a personal project in 2012-2013. Help us spread the word! Share Celebrate Home Magazine with your family and friends. Learn how to make jam! Want to learn how to make jam? My friend and jam master Sophia Stadnyk shows you step-by-step how to make jam in our spring 2013 issue of Celebrate Home Magazine. Turn to page 36 to learn how. Then turn to page 42 for Barbara Kelley’s article, “Cooking with Jam,” where you’ll find (jam-packed!) recipes for an appetizer, entree and three sweet treats. Barbara Kelley and I published this magazine series in 2012-2013 as a personal project. Click on the link below to download the free pdf of this issue! You can also view it on issuu.com here. Written by Sophia Stadnyk. Photography © Cindy Dyer. All rights reserved. It’s almost spring and I thought I’d share the spring issue of Celebrate Home Magazine again. Barbara Kelley and I created this magazine in 2012-2013 as a personal project and had so much fun doing it! Click on either of the links below to download your FREE pdf copy of this issue. This issue is jam-packed (and there’s even a jam-making feature with my friend Sophia Stadnyk! ), so download today and get started reading. 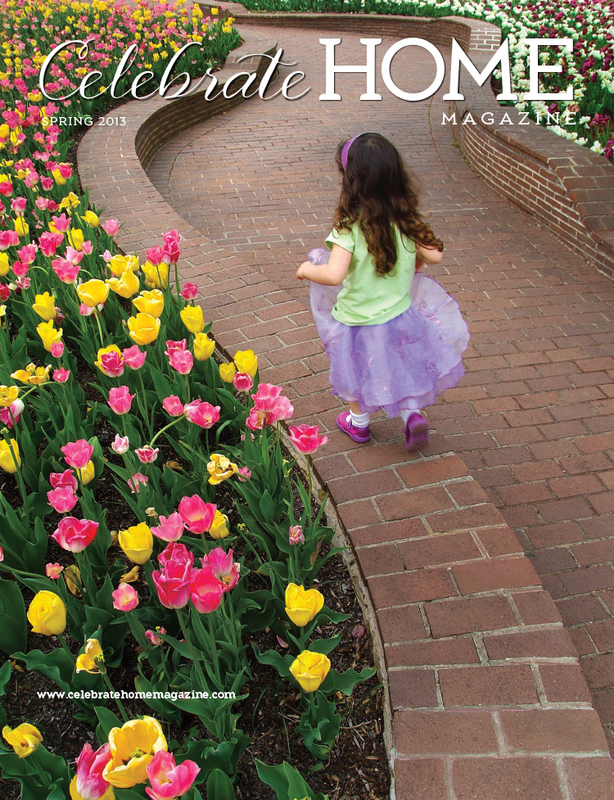 On the cover: What says “spring” more than colorful tulips? I was photographing this bed of flowers and was standing on the edge of the wall when this little girl, clad in a princess skirt with sparkly shoes, came running around the corner. I got this one shot and she was gone. Serendipity! Congratulations to my dear friend Michael Powell for getting his photos published in a spread in the local Mt. Vernon Voice newspaper. He was out shooting at Huntley Meadows one cold morning and the co-editor of the publication happened to be there. He asked him if he would like his work to be featured in the newspaper. He had a two page spread available to fill and Michael had to get him photos pronto. Nice showcase for your work, grasshopper! You can see more of Michael’s work on his blog at https://michaelqpowell.wordpress.com/.